Use the Windows Configuration Designer tool to create provisioning packages to easily configure devices running Windows 10. Windows Configuration Designer is primarily designed for use by IT departments for business and educational institutions who need to provision bring-your-own-device (BYOD) and business-supplied devices. You must run Windows Configuration Designer on Windows 10 to configure Azure Active Directory enrollment using any of the wizards. On devices running Windows 10, you can install the Windows Configuration Designer app from the Microsoft Store. To run Windows Configuration Designer on other operating systems or in languages other than English, install it from the Windows Assessment and Deployment Kit (ADK) for Windows 10. If you install Windows Configuration Designer from both the ADK and Microsoft Store, the Store app will not open. The Windows Configuration Designer App from Microsoft Store currently supports only English. 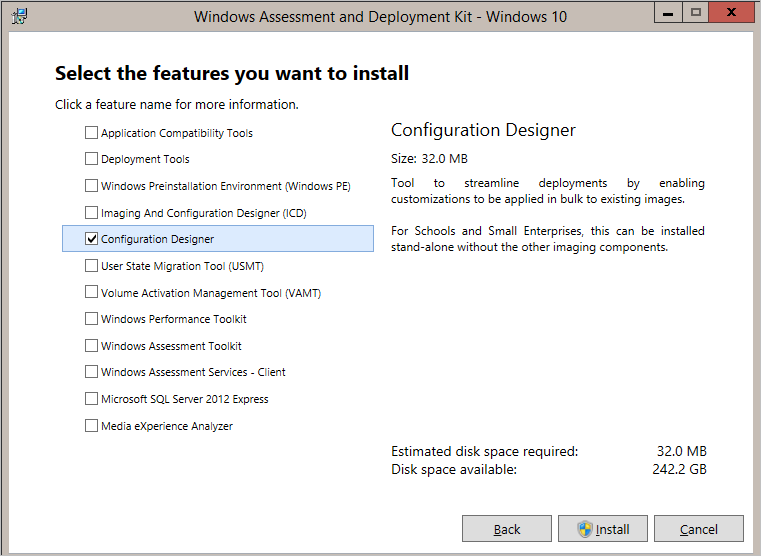 For a localized version of the Windows Configuration Designer, install it from the Windows ADK. Go to Download the Windows ADK and select Get Windows ADK for the version of Windows 10 that you want to create provisioning packages for (version 1511, 1607, or 1703). The rest of this procedure uses Windows ADK for Windows 10, version 1703 as an example. Save adksetup.exe and then run it. On the Specify Location page, select an installation path and then click Next. The estimated disk space listed on this page applies to the full Windows ADK. If you only install Windows Configuration Designer, the space requirement is approximately 32 MB. Make a selection on the Windows Kits Privacy page, and then click Next. On the Select the features you want to install page, clear all selections except Configuration Designer, and then click Install. Windows Configuration Designer will not work properly if the Group Policy setting Policies > Administrative Templates > Windows Components > Internet Explorer > Security Zones: Use only machine settings is enabled. We recommend that you run Windows Configuration Designer on a different device, rather than change the security setting. You can only run one instance of Windows Configuration Designer on your computer at a time. Be aware that when adding apps and drivers, all files stored in the same folder will be imported and may cause errors during the build process. The Windows Configuration Designer UI does not support multivariant configurations. Instead, you must use the Windows Configuration Designer command-line interface to configure multivariant settings. For more information, see Create a provisioning package with multivariant settings. While you can open multiple projects at the same time within Windows Configuration Designer, you can only build one project at a time. In order to enable the simplified authoring jscripts to work on a server SKU running Windows Configuration Designer, you need to explicitly enable Allow websites to prompt for information using scripted windows. Do this by opening Internet Explorer and then navigating to Settings > Internet Options > Security -> Custom level > Allow websites to prompt for information using scripted windows, and then choose Enable. If you copy a Windows Configuration Designer project from one PC to another PC, make sure that all the associated files for the deployment assets, such as apps and drivers, are copied along with the project to the same path as it was on the original PC. For example, when you add a driver to a provisioned package, you must copy the .INF file to a local directory on the PC that is running Windows Configuration Designer. If you don't do this, and attempt to use a copied version of this project on a different PC, Windows Configuration Designer might attempt to resolve the path to the files that point to the original PC. Recommended: Before starting, copy all source files to the PC running Windows Configuration Designer, rather than using external sources like network shares or removable drives. This reduces the risk of interrupting the build process from a temporary network issue or from disconnecting the USB device.